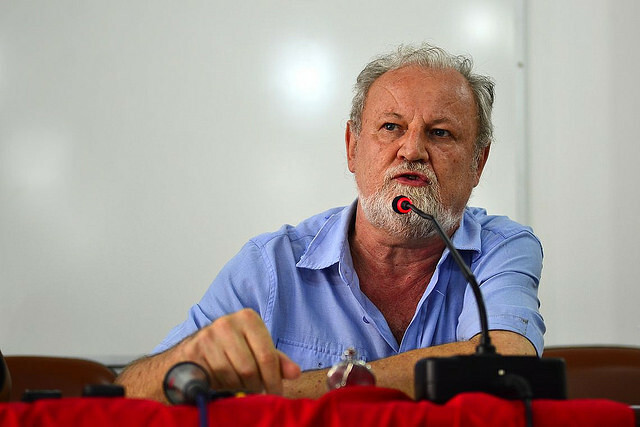 Electing a president and state and federal representatives who have a commitment to workers is how the people will be able to overturn the impacts of measures that affected basic rights such as health, education, and safety, according to João Pedro Stedile, from the board of the Landless Workers’ Movement (MST). Stedile spoke with Brasil de Fato about the elections and the political landscape in the country, arguing that casting a blank or null ballot only benefits those who want to keep the country in a state of crisis. The first round of Brazil’s general elections will take place on Oct. 7, and the second round is scheduled for Oct. 28. Brasil de Fato: How important are the upcoming elections? João Pedro Stedile: The October elections have historical significance for the working class and the people at large. There have never been elections in such a clear context of class struggle. On the one hand, the bourgeoisie needs to elect their president and members of parliament to legitimate the coup with the people while also implementing their Machiavellian plan for four more years, which is about putting all the weight of the economic crisis on the shoulders of the working class. So they have to keep removing workers’ rights, [attacking] the CLT [Consolidation of Labor Laws], Social Security, taking over public money that should be invested in housing, agrarian reform, education, and health. They also want to keep handing over all our national wealth to their allies: foreign capital and the United States government. On the other hand, for our side it’s exactly the opposite: we have to elect Fernando Haddad and a strong parliamentary caucus to overturn all measures implemented by the coup plotters. Therefore, the people should cast their vote as a class-based vote. The masses were not able to mobilize to defend Dilma [Rousseff]’s government and now, as they are defeated by unemployment and social inequality, they are not able to organize major mobilizations. So our weapon right now is our vote. And this is why it has to be a class-based vote. It’s only with our own representatives that we will be able to start a new project for Brazil, for the people, with the necessary structural reforms. We have to start with the economy, to start an industrialization process again for the country and secure employment and income for workers. A tax reform, in addition to controlling banks and interests. A media reform, an agrarian reform, an education reform are also necessary. We cannot forget to call for a constituent assembly in the medium term to promote a substantial political reform and a judiciary reform. What do voters have to bear in mind to choose their congressional representatives? In addition to electing [Fernando] Haddad and state governors who are committed to workers, we obviously have to make sure we elect a parliamentary caucus, both for the Chamber [of Deputies] and the Senate, that is fully committed to the working class and to a project toward changing the country. I know that we have very good candidates in all states, working class candidates, experienced comrades, people’s leaders, who have proved their commitment to workers. These are the ones we have to elect. People who are experienced in class struggle. People who are committed to the [working] class, and not with their own individual interests or mediocre vanities. The people must know who has been with us during strikes, occupations, struggles, taking to the streets. Similarly, we also have to denounce the candidates who are only committed to the interests of the bourgeoisie and to the looting of public coffers. What is the role of the Congress to push the federal government to focus on quality, public health and education? The next Congress [that will be elected in October and take office in January] must be constituted of members of parliament who encourage people’s organization and mobilization, and who will use their term for this purpose. The battle between the two projects that I mentioned earlier will be fought on the streets. The parliament is just a reflection of what will happen on the streets. This is why we need parliamentarians who fight, who mobilize, who have the courage and determination to explain to the people that power is not only in their representation, but rather in popular mobilization forces. The future Congress should be a space to complement a people’s government. It should be able to help call popular plebiscites to repeal all the measures implemented by the coup plotters. It should help overturn PEC [constitutional amendment bill] 55, which limits public spending on health, education, and agrarian reform. A member of parliament who gets elected with 200,000 votes but is not able to mobilize 100 people to defend our rights, Petrobras, Eletrobras, and our land and wealth is good for nothing. How can the people contribute to a fairer Brazil starting in 2019? We must explain to the people how important this election is. Explain that the project for the country for the next four years will be decided on October 7, and this is why we cannot hesitate. Everyone is angry at politicians in a broader sense. But that is because most politicians represent the bourgeois or themselves – the rich and privileged who take over parliamentary power to push their own class-based agenda. Even Globo [Brazil’s largest media conglomerate] bad-mouths politicians all the time in a broad sense, but does not mention that those who are guilty are the capitalists, the bourgeois. That is exactly meant to mislead the people. We must explain that casting a null or blank ballot in this election means helping the coup plotters; it means voting as someone who doesn’t want change. It’s a disengaged vote, even if they say they don’t believe in anyone [any candidates]. We have to vote for someone who will promote change in the parliament, in state governments, and vote for Haddad, who was appointed by [Luiz Inácio] Lula [da Silva] and is the only one who can face and defeat the coup-plotting bourgeois. The people must understand that they will be voting for gas prices, for sharing Petrobras revenue – will the money be spent on education or American shareholders? They will vote to have money for hospitals, vote for a new security policy. The best security is employment, income, and education for all. Police forces and the Army don’t solve anything. In Rio de Janeiro, people are seeing firsthand that the clampdown is just part of the violence, and not a solution. The people will vote to decide whether they want the social control of the judicial system, or whether they [judicial officers] can keep earning R$30,000 a month [more than US$7,000, while the country’s minimum wage is around US$220], plus housing allowance, clothing allowance, book allowance, taking 2-month vacations, while the people don’t have a penny to their name. This is why this election is not about a battle between parties. They don’t represent much now. Now it’s about class struggle: those who are for the people, the workers, and those who are for the coup-plotters, the bourgeois, the banks, and foreign capital. What should activists do for the next period? Well, as we are in the middle of a radicalized class struggle, while also facing a huge economic, social, environmental, and political crisis, that means the struggle will go on for a long time until we are able to overcome this crisis over the next few years with measures to protect the people. Therefore, activists must roll up their sleeves and be completely engaged to elect good governors, dedicated parliamentarians, and Haddad. After October, we must keep mobilizing and using the methodology of the People’s Congress, keep holding people’s meetings in every neighborhood and every city, calling the people to discuss a new project for the country. From October through December, we must discuss all the changes that have to be made, in the economy, industry, agriculture, the organization of cities, in health, education, agrarian reform, etc., so that the people can present their ideas and clearly understand what is necessary to change first – and soon. Over the next few months, we must promote debates all over the country, with all grassroots support. And then we must present our proposals to the new elected officials – at the state and national levels. Then, starting in January 2019, with Haddad, we must discuss new ways to promote people’s participation in government. We don’t need more governments for the people; now we will only tackle the crisis if it’s a government with the people. And to do that, we need to organize people’s participation in government, through popular plebiscites, referendums, consultations, sectoral committees, and huge mass mobilization efforts to push for the necessary change. The next cycle will be a cycle of struggle, a lot of discussion, and great mobilization. The worst is over now – the coup. Now [it’s time] to encourage the people to vote, to engage, and to build a new project, by the people, for Brazil.